We have seen HTC’s innovative patent idea on how to use stylus on capacitive touch screen, now the Taiwanese company has added a new idea surrounding the touch screen technology aiming to let consumers enjoy much pleasurable reading and control experience on tablet PC. 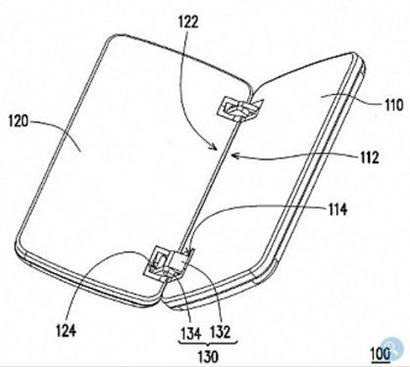 The patent is focused on dual-touch screen tablet PC-like design that is able to serve multiple functions either as a flip-able e-book reader or normal tablet PC. With the control mechanism built around its mechanical hinge, and depending on the angle (in degree) of the hinge, it will alter the function to fit well to one’s usage. For instance, when it is positioned like a notebook, one side of the screen will be transformed into a virtual QWERTY keyboard ready for typing while leaving the standing screen purely for display purpose. However, when it is laid flat on the table, the mechanism will trigger both screens to be merged as a single huge display with touch screen input capability, doubling the screen size suitable for reading purpose. Similar to other patent ideas, it may be still too early to confirm if this newly filed brilliant idea will be implemented in HTC products any time soon. Nevertheless, the usage is not only limited to tablet PC usage but as long as the product is in clamshell design such as mobile phones or any portable devices, then it may find the advantage to greatly enhance users’ experience with automated mode switching on-the-fly.